One Of The Biggest '90s Mysteries Has Just Been Answered: Why Didn't Marvin And Jolina Become A Couple? Many expected a reel-to-real romance. What the hell happened? Before there was even #AlDub, or the rival network's KathNiel, those who grew up in the '90s had the privilege to get their kilig on to several of the most memorable love teams local showbiz has ever seen. Claudine Barretto and Rico Yan. Judy Ann Santos and Wowie de Guzman. Angelu de Leon and Bobby Andrews. Kaye Abad and John Lloyd Cruz. One of these highly revered tandems is the Jolina Magdangal-Marvin Agustin pairing, which took off during the two's teenage days on Gimik (1996-1999), and carried on in the lengthy drama Esperanza (1997-1999) and the many films Marvin and Jolina topbilled. And just like any other hit tandem, talks of reel-to-real romance hounded the on-screen couple, insisted by fans who are hoping for a happy ending between the two. 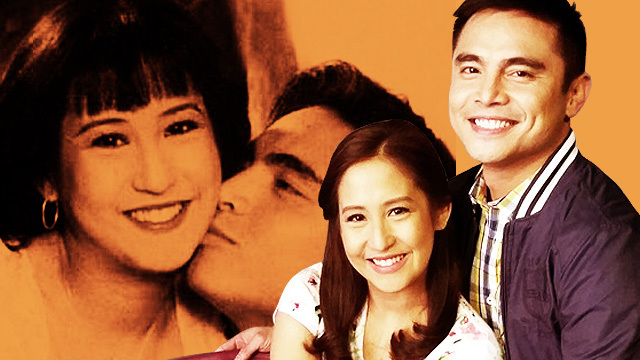 And it was only recently that Jolina and Marvin—who are once again together in the ABS-CBN family drama, Flordeliza—explained why their flawless chemistry on TV and film didn't translate to real-life romance. In last night's episode of Aquino & Abunda Tonight, Marvin and Jolina were asked by host Boy Abunda if they really fell in love with each other during their heyday. "Nakakatakot pong mahalin si Jolina. Parang masasaktan ka eh." Yep—like straight from a movie script! We can't quite comprehend what Marvin really meant with those lines, but if we understood it correctly, he just admitted not having enough balls to pursue Jolina and make it happen. Now, she is happily married with musician Mark Escueta with whom she has a child, while Marvin busies himself with his twins and his business empire.